Magic has been franchised. Magical conveniences are sold everywhere like designer coffee. Everyday life is filled with technical and magical wonders. Only, the magic is murdering people. Thoth Corp's hot new spell is turning people into ravening monsters. Their only hope to quietly rectify the situation before the epidemic spreads is the spell architect they framed and sent to prison. El's response to his former partners wasn't polite. 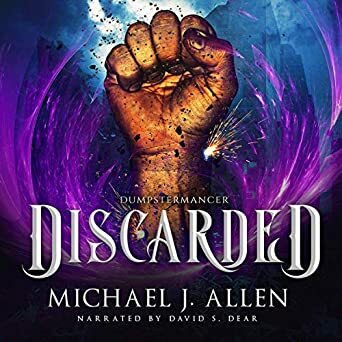 Homeless, forbidden to use government-regulated magic, and barely surviving out of dumpsters, Eli struggles to rebuild his life. Fairytale rats thought long extinct with the rest of the fey rescue Eli from murderous vigilantes, but at a cost. They force him to save fairy matrons stolen away by Thoth's monsters, thrusting Eli between his old company and a shadow war waged against humanity. To stop the war, cure Thoth's victims, and rescue the city, Eli need only find some way to make magic out of trash. I would consider myself a fan of fantasy, but there are certain aspects of the genre that give me pause. Due to a conservative Christian upbringing, I steer clear of the darker fantasies. In steps magic, an element that can be anything really. Doesn't bother me itself, but I'm conscious of the world I'm transporting myself to. The world of this book is an interesting Urban fantasy with some elements of cyber tech or punk or something. The magic is left largely unexplained except that it's science the characters don't even understand. And that's why I like it. There's no dark forces at play here, but you still get the wonder of fantasy. Magic plays a critical role, though it need not be that way. The main character's story could have been told without magic, and it would have been just as strong. That's what makes a great story. Not the veneer we splash on top to make it unique but the bolts of the story, the struggle of the human condition. The main character was framed and sent to prison, but now he's out. He wants to be left alone, but that would ultimately be a boring story. Much better for him to be faced with some corporate, magical crap that went down while he was away. And no one is going to fix it but him. If he's caught using magic, he could go right back to prison. What's a guy to do? What makes this a four star book instead of a five star one is that I didn't feel like I was on the edge of my seat the entire time. I wouldn't call the slower parts boring, but there was a definite change in pace at times. There was enough of the good stuff to overcome any of the slower parts. Good story from a great author.